The Mortgage and Housing Crisis - Is History About to Repeat Itself?The Mortgage and Housing Crisis - Is History About to Repeat Itself? The Mortgage and Housing Crisis – Is History About to Repeat Itself? Are We Opening Pandora’s Box to a New Housing Crisis? 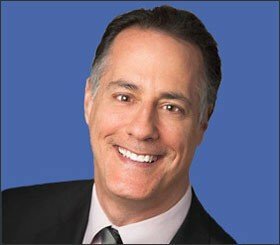 With the regulator of Fannie Mae and Freddie Mac announcing that the Government Sponsored Agencies will probably start purchasing loans with 3% down payments, it’s understandable that people would be concerned that we’re opening up Pandora’s Box again to a new housing crisis precipitated by terrible lending practices. 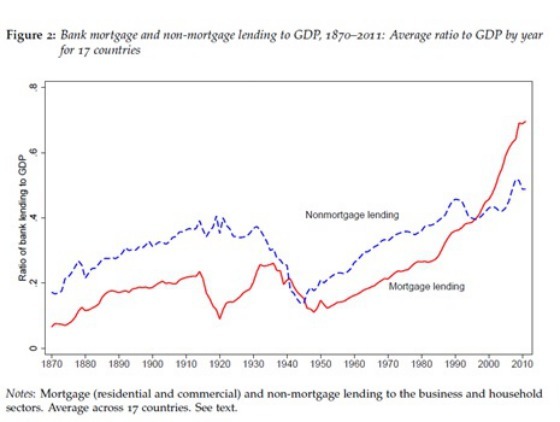 I read an interesting piece of research about the history of mortgage lending and how impactful it has been on many economies. 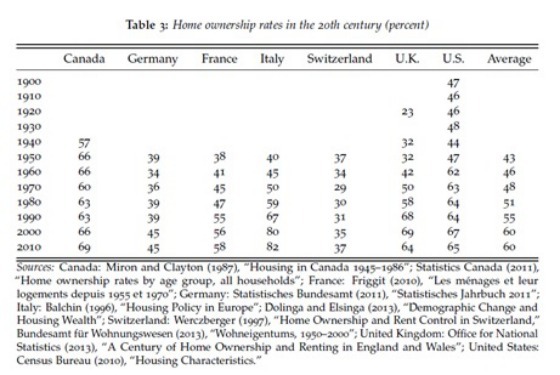 The authors point to mortgage lending as the biggest reason for the financialization of western economies. Financialization translates into a rising share of national income going towards financial activities, more household debt, and expanding balance sheets of financial intermediaries. The authors have uncovered a dataset for 17 advanced economies going back to 1870. The authors focused heavily on the subcomponents of lending and how capital was allocated between secured and unsecured loans as well as lending to businesses and households. There is a very noticeable trend of real estate lending increasing over time and unsecured lending to businesses and households dropping. In 1900 real estate loans made up approximately 30% of total bank loans and grew to 60% today. The following graph shows how its market share has grown over time. 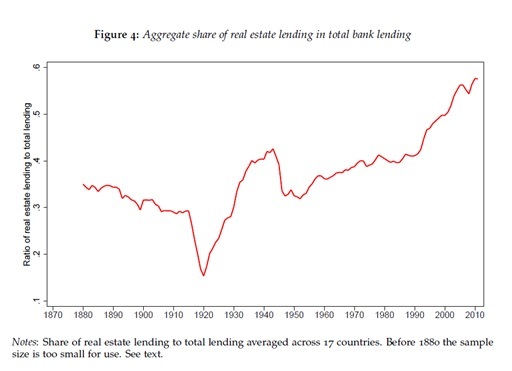 The graph clearly shows the huge amount of real estate lending that took place in the 1920s up until World War II and then it came to a screeching halt. It has then grown consistently in terms of market share since the 1950s. 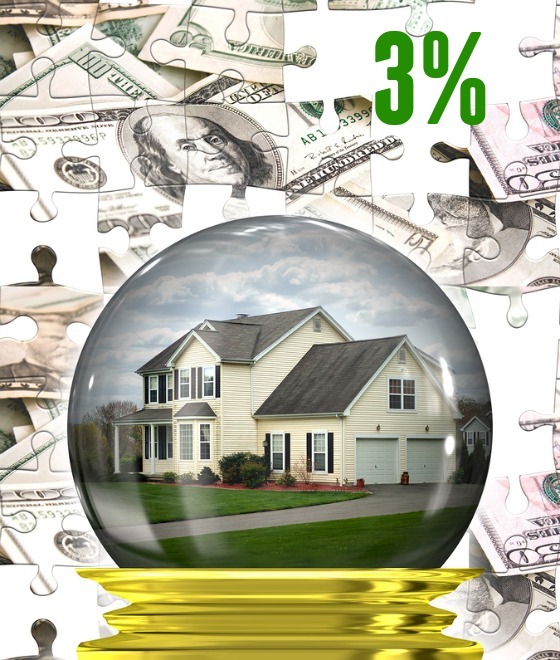 One worrisome trend pointed about by the authors is that mortgage lending has grown at a faster pace than the underlying asset values, resulting in increasing debt levels for households over long periods of time. Prior to World War II, real estate lending booms rarely led to financial crises but they have become much more important since this time. This is particularly true in the United States as the following charts show. Here, with our granular historical dataset, we perform more formal benchmarking and statistical analysis for the near-universe of advanced-country macroeconomic performance since 1870, covering over 90% of advanced economy output, and encompassing up to 200 recession episodes, with 1⁄4 of them linked to a financial crisis and 3⁄4 being normal cycles. With sample size comes statistical power, and our hypothesis tests show that the typical output path during recession and recovery in financial-crisis recessions is significantly worse than in normal recessions, amounting to a cumulative loss of 20% of annual output over 5 years….Recessions that follow larger credit booms tend to be significantly worse, all else equal. Furthermore, we can show that contemporary business cycles are predominantly influenced by trends in the mortgage component of credit. Since WWII, it is only the aftermaths of mortgage booms that are marked by deeper recessions and slower recoveries. This is true both in normal cycles and those associated with financial crises. Our findings echo the developments witnessed in the aftermath of the global financial crisis and also underline the need for additional nuance in monitoring the build-up of financial instability: it is not just a matter of how loose credit is in the aggregate, but also for what kind of purpose it is used. 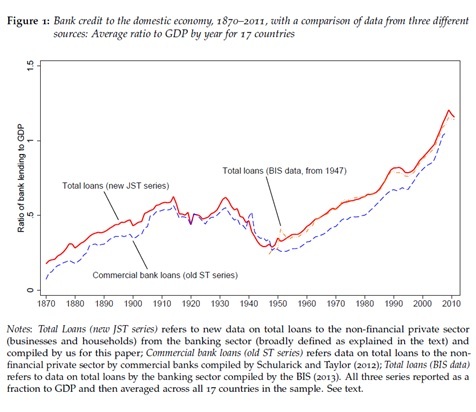 After a big run up through the early 1930s, lending dropped quite a bit as a percentage of GDP until 1949. Since then it has grown at an almost uninterrupted pace. The next graph shows that mortgages have grown much more rapidly than other forms of lending, particularly since 1990. 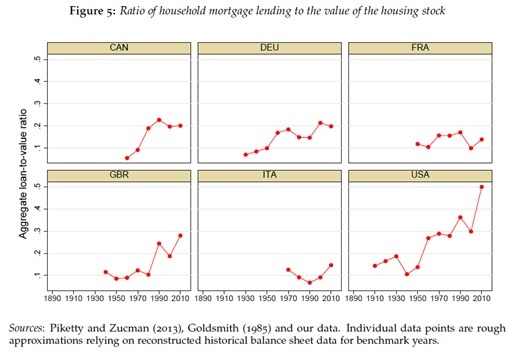 Not surprisingly, the emphasis on mortgage lending to households has led to a significant increase in homeownership across the world, particularly in Italy, the United States, and the UK. Hopefully Congressional representatives and the FHFA, the regulator of Fannie Mae and Freddie Mac, will take the time to read this study. They might learn something of valuable, since it would appear that recent history seems to be easily forgotten. Are we are reopening Pandora’s box to a new housing crisis that is precipitated by terrible lending practices? Is history about to repeat itself?